Mr. Fox is almost 7 weeks old and I think we're finally getting into a routine *KNOCK ON WOOD*. 5:00am - Fox starts crying so I wake up and feed him and my day begins (yup, I wake up at 5am. Oh but just wait, it gets better!). 5:30am - Feed the animals and straighten the house. 6:00am - Exercise while Fox is still sleeping. 7:00am - Eat breakfast, shower, take the doggie to go potty, all while Fox is still (hopefully) sleeping. 8:00am - Fox wakes up for another feeding so I do that while sitting at my computer working, checking emails, reading blogs, watching Fringe or X-Files on hulu, facebooking, and recently I've picked up tweeting (sort of). Fox is awake pretty much from now until 6pm and takes half hour naps (if you can even call them that) every now and again. During his naps I blog, put in a load of laundry, pay attention to the other pets, get some good work done, etc. 10:00am - Turn on the Price is Right. 12:00pm - Warm up a frozen Weight Watchers meal for lunch. 4:00pm - Finish working for the day and sit down with Fox and watch some tele. 5:00pm - Chris comes home and we eat dinner and then I pass Fox off to him because let's be honest, it's been a long day and my arms (and ears) are tired. 7:00pm - I go to bed. Yes, I go to bed around 7pm. 3:00am - Fox wakes up for a feeding. I'm hoping he can make it through the night without waking up soon. I like routines and schedules and now I think I'm finally figuring things out. Of course, now that I've written it down it'll prolly go out the window :) But I'm working on being more flexible. 7 weeks!?!?!? Holy cow time flys!!! your schedule sounds like mine...well, 19 years ago. I was just thinking today how time flies by SO fast! It feels like just last week, you and I were emailing about having kids! And now you have an (almost) TWO month old! And I'll (hopefully) have a baby next summer! Isn't that crazy?!?!? Am I babbling? LOL. I need a routine. Maybe I should get one too. *sigh* I need some motivation. You are doing well Paige! Master N is 23 months and we still don't really have a routine, not to mention that he only started sleeping through the night about 4 months ago and I am two weeks of Baby Number 2 arriving - goodness me, so days I wonder what I was thinking! By the way the photos of FOx are so, so precious! thats swesome! What do you do for exercise? Does Chris ever have homework? Thats nice he can take him. who does the late nigh feeding? Mr. Fox is so stinking cute!! I could look at his pictures all day! And ps...you are looking great! Aren't you doing WW? 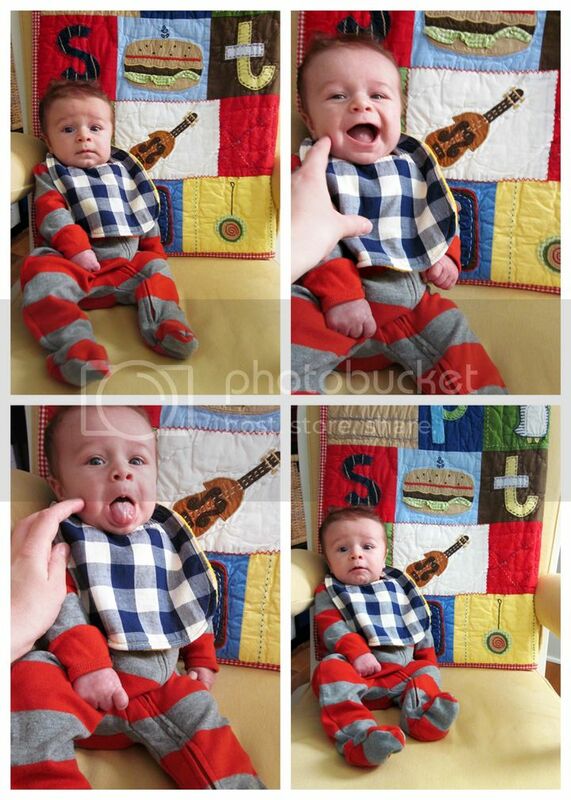 Wow what a great baby! Mine didn't start sleeping like that til he was 5 months old! You are one lucky mama with a cute little boy to boot! I totally understand...my husband has the same problem! He gets too distracted with Alyssa to do homework! He's so sweet! 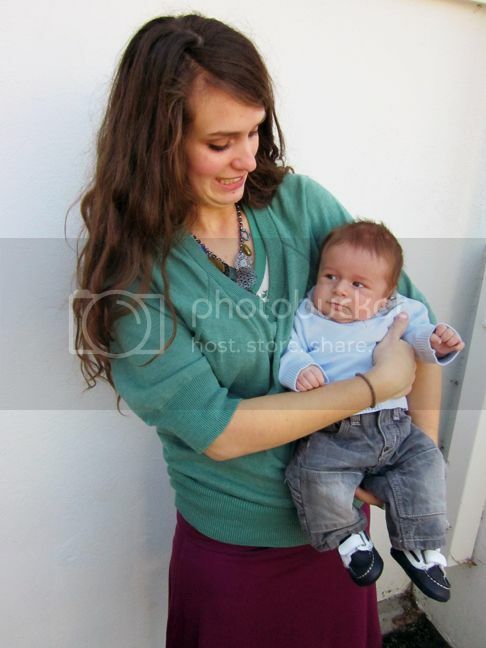 I LOVED holding him the other day, makes me baby hungry. :) It sounds like you're getting that schedule down great! I just had a patient whose name was Thomas Fox and it made me think of your little one. Love that bib! He looks a lot like his daddy!